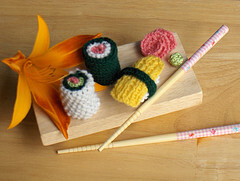 Knitting and Crochet patterns have taken an oriental flavor since the introduction of Japanese craft books and a knitting craze amongst young crafters. I thought I would start off the feast with a platter of sushi delights. 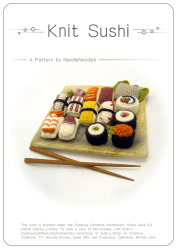 Knitted Sushi plattern – Free pattern on Ravelry. 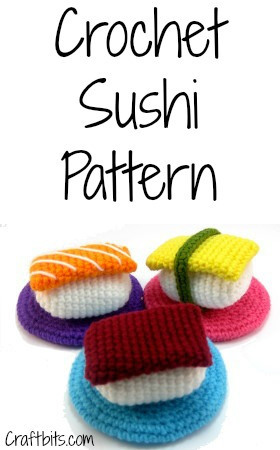 Crochet Sushi Platter – Amy has not only provided us with free patterns but has presented the sushi like a 5 star restaurant which makes me salivate just looking at it. 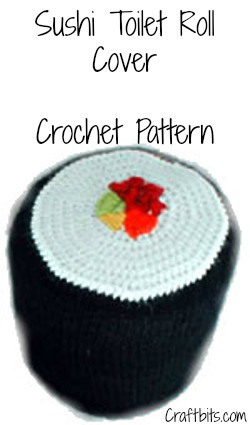 Crochet Sushi Toilet Roll Cover I am sure your mother always told you not to eat whilst on the toilet, but this sushi themed toilet roll seems to be the next best thing to toilet takeout.